This post is for me. After sitting in a staff meeting this morning and speaking the word "esperanza" - hope in Spanish, I needed this reminder. I originally wrote this post May of 2009, but my heart needed to hear it again now. Sometimes, it does a heart good to be reminded. As I hung up the phone, I could hardly breathe. The news was simply too wonderful to contain. I felt as though my heart would burst with joy and excitement. My husband and I were going to have a baby...a dream come true. This wasn't the first time I had heard these words from the doctor or experienced this overwhelming flood of emotion. Twice before, I had been able to surprise my husband with this same, wonderful news and watch as his face lit up, and his eyes sparkled. We both have a deep love for children and having one of our own was a dream we both shared and talked about often. Twice before, however, I had also known the deep sorrow and silent grief that rips your heart apart when you lose that little life before you have ever had a chance to meet your son or daughter face to face, or embrace and tenderly kiss them. This time was going to be different, though. I just knew it. I could feel hope running all through out my body, from my head to my toes! I had lost my father eight months earlier, and I felt as though this was God's way of bringing new life back into mine and joy back into my heart. I could hardly wait to tell my husband and the rest of the world. Even though my faith was strong, and my hope sure, I have to admit, there were moments when I would start to worry about losing this precious little one, too. When those moments came, however, God was always faithful to send a reminder to keep me hoping. Like the time I was sitting in a hospital waiting room, waiting to have some routine blood work done. I started to feel anxious, but before I had a chance to dwell on these feelings, a beautiful little girl, about three years old, came and sat down right next to me. We talked and laughed and had the best time. After a few minutes, I asked her what her name was. "What a beautiful name. Your name means HOPE in English, doesn't it?" I asked. She just smiled, but her mother nodded and said, "Yes, yes it does." I knew this because Esperanza was the "girl" name I had picked out for this new little one. Esperanza - Hope, because once again, through this pregnancy, God had filled my heart with hope. Instantly, my fear vanished and hope ruled my heart. 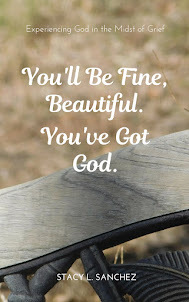 God was with me and everything was going to be just fine. Weeks flew by and soon, at my six weeks Dr. visit, I was able to not only see my baby, but to hear the beating of it's heart. "Your baby has a very strong heartbeat. Everything looks and sounds terrific!" the doctor declared. Still, as days went on, fear tried desperately to steal my joy. With each moment of fear, however, God was faithful to send me a hope-filled moment to hold on to. Like the time I was driving home from work and caught myself once again fearful of facing yet another miscarriage, and another heartbreak. Turning a corner, a sign at a church beckoned for my attention. There, for all the world to see, were God's words of hope. I pulled over to the side of the road, found a pen and paper, and copied down this powerful word from God. I decided, right then and there, to commit this particular scripture to memory. The next time Satan tried to bring doubt or fear to my heart or mind, I would hold up my shield of faith and quench his fiery dart by boldly proclaiming the hope in my heart. Weeks turned into months - three to be exact. Then, my hope died, right along with the death of the tiny life I had carried inside me. I was devastated. This time was suppose to be different. How could this be happening again, especially after God had been so deliberate in His attempts to encourage me to keep hoping, to keep believing? I felt totally and completely numb. To be totally honest, I felt as though God had been teasing me. He knows the end from the beginning. He knew this pregnancy was going to end just like the two before it, and yet he kept dangling hope out there in front of me. My numbness soon turned to anger and bitterness. Time went by and I struggled to keep my relationship with the Lord vibrant and strong. I had walked with the Lord long enough to know his true character: all love, all mercy, all wisdom, all the time. I knew God loved me and wanted only the best for me. I knew He was always working all things for my good and His glory. I knew what Satan meant for harm, He could and would use for my good. My head knew all of this, but my heart, oh my heart. It felt betrayed. It had dared to hope. Then one night, as I was reading in the Psalms, God, in his tenderness, revealed to me the true substance of the hope He kept placing in my heart during those three months. I suddenly realized that my hope had been completely misplaced. All that time, I had been placing my hope in the life I carried, not in the ONE who was carrying me. God did know how this pregnancy would end. He knew my heart would once again be broken into a million pieces. He knew all of this and because He did, He was preparing me for this loss by placing seeds of hope into my heart. Not hope in my baby, but hope in HIM! Tears filled my eyes, once again, as I found myself on my knees thanking God for being all loving, all merciful, all wise, all the time. Over and over again in the Bible, we find verse after verse leading us to the only one we can truly place our hope in. Now, years later, I would love to be able to tell you that my heart no longer feels the pain of these losses, but that wouldn't be true. Not a day goes by that I don't feel the hurt. Yet, through the hurt, I have chosen to keep placing my hope in my God. 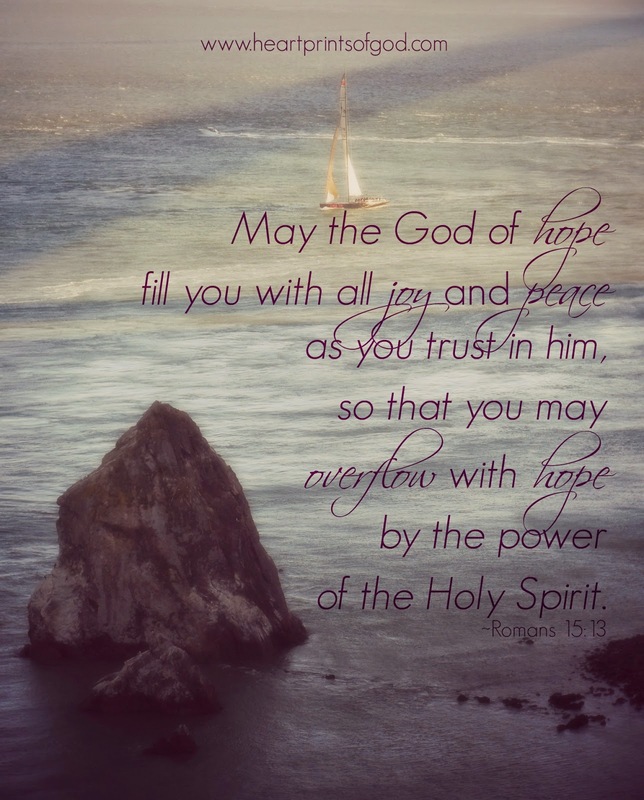 As I allow the God of hope to fill me with joy and peace in believing, I abound with hope, through the power of the Holy Spirit. Have you ever been disappointed by God? Have you ever felt as though he dangled hope in front of you only to lead you to heartache? If so, I encourage you to take a closer look. Could it be, like me, your hope was misplaced? The world and all that is in it will let us down, abandon us, and leave us broken hearted, but our God - who is all love, all mercy, all wise, all the time - never will. Put your hope in Him and I guarantee, you won't be disappointed. Stacy, thank you for sharing this post. I lost 6 babies between 24-26 weeks. Like you, I was anxious many times ! and like you I put my hope in the baby. BUT God in His goodness let this baby go full term, and she was strong and healthy. During the pregnancy God revealed to me AND to my new doctor..what had been going wrong, and how to " fix" it. So, I started fostering.. At first it was under 2's, but then a teenager. Woohoo...I had found my calling. All that love went on 39 teens over 35 years, and not one bit was wasted. We often don't know until a few years later just how God will work through our pain and suffering, but redeem it He does ! YOU, precious sister, have the most marvellous gift of encouragement. Everything you post, whether it be words of pics...is a rich blessing to me and to many, I am sure. I am sure you have become so incredibly good at what you do BECAUSE you have known suffering and grief ~! You are one of my all time favourite " posters" on FB. Thank you for allowing God to work in your so richly and so deeply.